When you live in a state where the governor uses the phrase “train cult,” transit victories are hard-fought. That has been particularly so for the Cincinnati streetcar. In the decade-plus this project has been moving toward construction, it has seen more assassination attempts and intrigue than the literary heroes of ancient Greece. You’ll recall that earlier this year, Cincinnati’s rail ambitions suffered a setback when Governor John Kasich yanked about $50 million that had already been promised to the project. Not satisfied with that unprecedented and dubiously legal action, Kasich went further, adding a line to the state budget that prohibited any state dollars from being spent on rail service in Cincinnati. But the streetcar coalition is an experienced and battle-tested group. They fought back, scaling the project down by about a third, then forging ahead without any state money. Now, as the construction deadline nears, the streetcar faces what could prove to be its last obstacle (but, really, who knows). An opposition group calling themselves, COAST (Coalition Opposed to Additional Spending and Taxes), is working to get an issue on the November ballot that would forbid the city from developing any rail transportation until 2020. 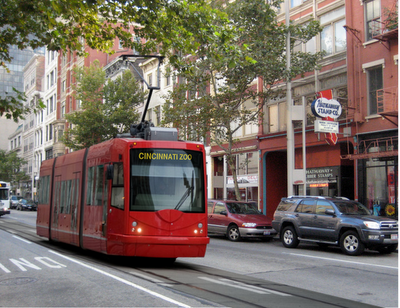 Despite clear indication from the voters, the city, and (at one time) the state and federal level that the Cincinnati Streetcar project was a positive contribution to changing Cincinnati for the better, there are those who would rewrite the rule books. The first vote was not enough. It is time for another. A ten-year ban would force Cincinnati to miss out on an entire generation of building infrastructure, in a time when gas prices are certainly not getting any cheaper, and Cincinnatians will be desperate for options to get around. Can anyone imagine a highway project receiving similar treatment? Elsewhere on the Network today: Walkable Dallas-Fort Worth says skyscrapers in the absence of livability amenities are just vertical sprawl. The League of American Bicyclists blog reports that Wisconsin advocates were able to restore $2 million in zeroed-out bicycle and pedestrian money to the state budget. And WABA Quick Release reports DC is putting traffic officers in the bike saddle.